S&S 93" big bore Hot Set Up Kit upgrades 74" and 80" shovel engines to 93" displacement at approximately 8.5:1 compression. 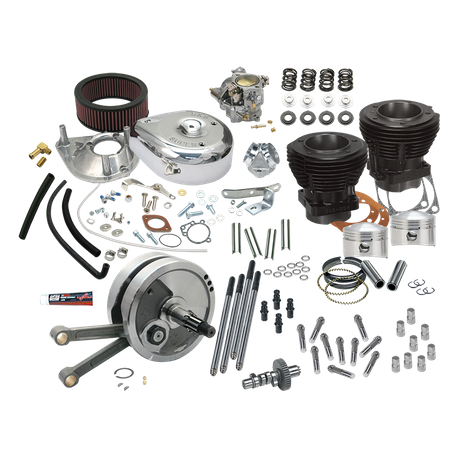 The kit includes S&S 3-5/8" big bore cylinders and forged pistons, a dynamically balanced 4-1/2" stroke flywheel assembly complete with S&S heavy duty connecting rods and mainshafts, an S&S 514 camshaft, valve springs, adjustable chromoly pushrods, and an S&S Super E carburetor kit complete with manifold and teardrop air cleaner. The cylinders are cast from high strength engineering grade grey iron for superior wear resistance and heat dissipation, and are finished with durable gloss black high temp powder coat. Crankcases and cylinder heads must be bored to accept larger 3-5/8" bore cylinders Not legal for sale or use on CA or EPA pollution controlled vehicles 1978 and later.